Chile's President Michelle Bachelet signed a bill Wednesday that seeks to ban plastic bags in more than 100 coastal areas in a bid to halt the accumulation of ocean plastic. 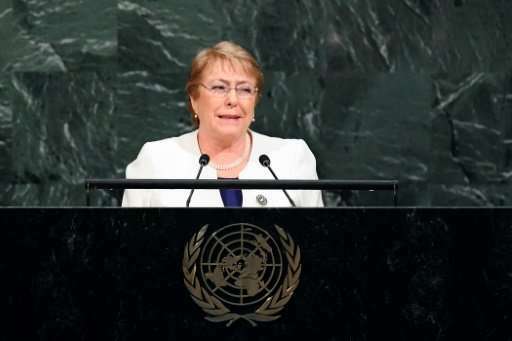 Bachelet said the move was aimed at "taking care of our marine ecosystems." "Our fish are dying from plastics ingestion or strangulation, it's a task in which everyone must collaborate," she said in a speech in the surfing resort of Pichilemu, 120 miles (200 kilometers) southwest of the capital Santiago. In addition to banning the use of plastic bags in 102 coastal villages and towns, the bill will also allow non-coastal areas to join in the project to restrict or eliminate their use. The World Wildlife Fund said the move "marks a very important milestone for Chile and opens the door for the whole country to say goodbye to plastic bags." "We hope that parliamentarians will transversally support this initiative which is good for the country," said Ricardo Bosshard, head of WWF Chile. A 2015 study published in the American magazine Science estimated eight million tons of plastic are dumped into the sea annually. Plastic packaging of all kinds poses a serious threat to the environment, affecting millions of marine species. Toxic particles from degraded plastic in the ocean are ingested by fish and, through the food chain, by humans. Bachelet's government plans to create 1.6 million square kilometers of marine conservation areas by 2018.